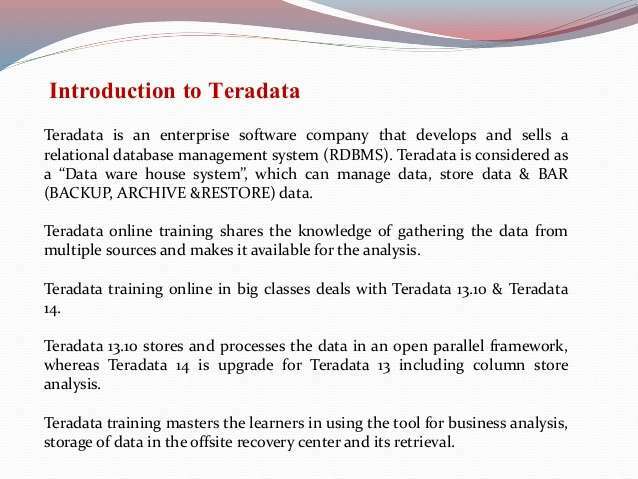 Teradata is enterprise software introduced by Teradata Corporation, America. 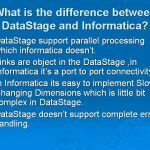 Basically, it sells relational database management system (RDBMS) for data warehouse and analytic applications. It stores data and manages data. 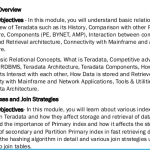 Teradata database is RDMS which helps in driving the company’s Data Warehouse. It helps the company to grow. It supports business growth from gigabytes to whooping hundreds of Terabytes. It is an open system. It works on UNIX, LINUX and Windows. It can connect with other clients through TCP/IP and channel connection. 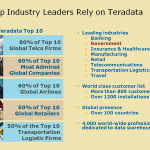 Why are we using Teradata? It has the ability to keep up the rapid changes. It supports active data warehousing. It supports CRM (Customer Relationship Management) also. Single data store. It never replicates data for a different request from the different clients. It has Scalability. That means, it increases performance. But for that outcomes never delay. It has the ability to model the business, which is very crucial part of any organization.